(NewsUSA) - Teachers deserve every break they can get. 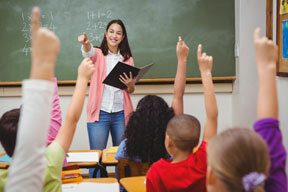 Reports show that wages for educators have been declining, and some work two jobs to make ends meet. Meanwhile, many teachers pay out of their own pockets for books and supplies. As the new school year approaches, Barnes & Noble wants to make it a bit easier for these dedicated educators and administrators. Year-round, the bookseller recognizes all the wonderful things that educators do by giving them 20 percent off school supplies. Each weekend in August, Barnes & Noble amplifies their thank you with an Educator Appreciation Month. Each weekend in August, Barnes & Noble increases its discount to 25 percent for most books, gifts, games and toys for teachers and administrators, including items in an expanded back-to-school section. "Educators do so much for us, our children, and our communities," says Tracy Vidakovich, Vice President, Business Development for Barnes & Noble. "That's why we try to give back in different ways, including our year-round offers for teachers, as well as special appreciation periods like this August's 25 percent discount for most merchandise in our stores." While educators are shopping during these August weekends, they can also treat themselves to drinks and food at Barnes & Noble Cafés for 10 percent off. In addition, they can snag educational tech products, such as Code Gamer learning kits, at a 10 percent discount. When it comes to back-to-school shopping, Barnes & Noble has a lot to choose from this year. The bookseller not only has the books, pens, and other school supplies educators need, but it has an expanded collection of back-to-school items that includes JanSport backpacks, S'well water bottles, and Skullcandy headsets. "Between grading assignments, communicating with parents, and planning classes, teachers are busy well beyond the school year," Vidakovich says. "That's why we want to support them and make things easier by helping them save throughout the year, whether they're teaching or preparing for their next class." Barnes & Noble's Educator Program has been dedicated to providing discounts to public, private, and home-school educators for about a decade. Sign-up is free. After this August's Educator Appreciation days, Barnes & Noble's next major educator deal will come in the fall, with another Educator Appreciation Week from October 6-14, 2018. To take advantage of these discounts, educators can enroll in-store, or by completing the Educator Application online and bringing it to their nearest Barnes & Noble location. Educators can also find more information at www.bn.com/h/bn-educators.